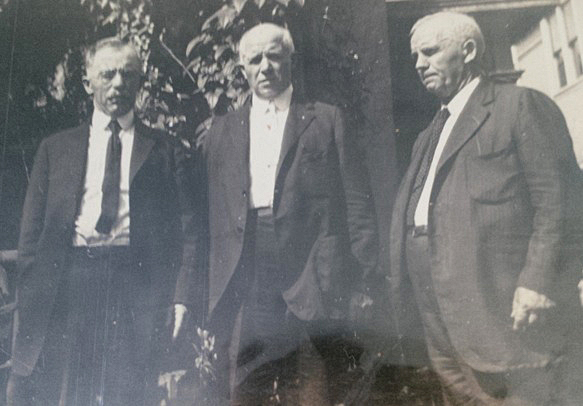 The Smith Brothers in Springfield OH, 1922: (L to R) Maurice L., Harold E., and Herbert G.
Harold Edward Smith, DDS, the second son of Alonzo and Ellen, was born in Paintersville, Greene County OH on July 19, 1861, and attended the Ohio College of Dental Surgery in Cincinnati from 1887 to 1891. His first wife, Minnie Lewis (born Sep. 22, 1867), died of erysipelas on Jan. 17, 1903, aged 34. They lived at 520 East Church Street, a couple blocks away from Urbana High School; the 1900 census shows Harold born in "Jul. 1862" and Minnie in "Sep. 1869." In the 1904 Urbana directory, Hal's office was at 30½ Monument Square (one door down from brother Maurice and seven from brother Herbert). He and Pauline shared their home with his mother Ellen and sister Leanna. Hal married Pauline Carter (born Sep. 18, 1863/64, daughter of Dr. Joseph S. Carter [1825-1903] and Mary Jane Minor [1834-1911]); Pauline was "a member of an old Urbana family" on West Reynolds Street. She and Hal eloped to Kentucky on June 30, 1914: "a surprise to many of their friends although the event had been suspected for some time by many." They had no children, and by 1920 were occupying half of a double house at 126 West Reynolds; Leanna remained at 520 East Church as its "housekeeper." 1930 found all three together back on East Church. Hal died of a cerebral hemorrhage on Apr. 2, 1935, aged 73, and was remembered in 1983 as "the most boring man in the state of Ohio" by his nephew F.S. Smith's wife Ada Louise. (Pauline was remembered as merely "odd.") F.S. 's daughter Mellie added that on some trips to Urbana "someone decided we must go to call on Hal and Pauline. This was indeed (for me, at least) a pure duty call, and I felt as though we were all secretly feeling the same thing. The house inside was all heavy dark furniture, wood, very heavy drapery to shut out all light—and no joy was in the place." Dr. Harold E. Smith, widely known dentist of the community, who had practiced his profession in Urbana for 40 years and who retired about two years ago because of ill health, died Tuesday at 3 p.m. at his home 620 [sic] East Church street, from a cerebral hemorrhage. Dr. Smith was a native of Paintersville, Ohio, and came to Urbana as a young man. He was a graduate of the Ohio College of Dental Surgery, Cincinnati. He was a member of the Urbana Methodist church and in Masonry was a member of Champaign Lodge F. and A.M. chapter, council and commandery and was a 32nd degree Mason. Surviving are his widow, Mrs. Pauline Smith and a sister, Miss Leanna Smith, at home. A number of nieces and nephews also survive. Funeral services wall be held from the late home, Thursday at 2:30 p. m. conducted by Rev. Kenneth S. Learey, pastor of the Methodist church. Burial will be in Oak Dale cemetery by Humphreys & son Company. 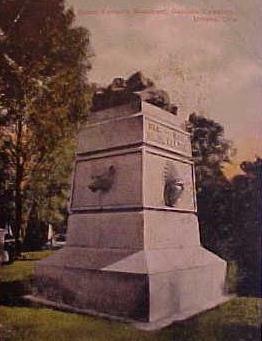 A picture of Hal's marker can be seen at ~smith/harold. In 1940 Pauline was still at 520 E. Church (a house valued at $6000). By 1952 she lived at 409 Scioto in Mt. Vernon, Knox County OH, with her niece Laura O'Kane Perley. Pauline died Feb. 22, 1952 in Knox County OH and was buried with Hal in Oak Dale. Dr. M. L. Smith received his early education in the public schools of Greene and Champaign counties, later taking a classical course of two years in Urbana University. He then taught school for about ten years in Clark and Champaign counties, also a short time in Kansas. He met with much success as a teacher and his services were in good demand. But he finally decided that his true bent lay in another direction, and upon abandoning the school room, he took up the study of medicine, entering the Cincinnati College of Medicine and Surgery, from which institution he was graduated with the degree of Doctor of Medicine, with the class of 1891. Soon thereafter he began the practice of his profession at Pickrelltown, Logan county, Ohio, where he remained two years, removing in 1895, to Urbana, Champaign county, where he has since been engaged successfully in the general practice of his profession.... Doctor Smith is a member of the Champaign County Medical Society and the Ohio State Medical Society. Politically, he is a progressive Republican. He belongs to the Masonic lodge, and is a member of the Methodist Episcopal church, and has been a member of the official board of the same for the past fifteen years. The SFA agrees that M.L., like his brother Gus, taught school in Kansas during 1885-86; then attended the College of Medicine and Surgery in Cincinnati from 1887 to 1891, the same years that Hal was in dental school. (Apparently they roomed together during this time.) M.L. took a special course in diseases of the eye and ear; then practiced in Pickrelltown, an unincorporated community in northern Monroe Township, Logan County OH, southeast of Bellefontaine. In the 1890s he married Mary Reed of Middletown, with whom he lived in "Monroe's Capital," which may be (or have been) in the same township. In 1904 M.L. 's office was at 31½ Monument Square, next door to Hal's and not far from Gus's. His household lived at various addresses, always on Urbana's South Main Street. At some point between 1900 and 1910, Carrie "adopted (not legally)" M.L. 's cousin Irene Lavinia Yeazell, daughter of Ellen Wikel Smith's sister Josephine Wikel Yeazell; the 1910 census shows Irene living with them, working as a cigarmaker. (Irene's surname is spelled "Zeazell" and M.L. appears as "Mannie L.") Unlike Hal and Pauline's house, Carrie and M.L. 's "lovely old home rang with fun, music and laughter," F.S. 's daughter Mellie would recall. "There were always all kinds of games being played but the high point for me was the huge grand piano[;] I pounded out tunes to my hearts content and no one shushed me up. Then much group singing, as everyone gathered round." Maurice Leigh Smith died of acute indigestion and a cerebral hemorrhage on Apr. 10, 1929, aged 66; he was buried in Oak Dale on Apr. 12th. A year later his widow Carrie was living with Margaret and Gertrude at 207 West Market Street—Ellen Wikel Smith's old home, and possibly Samuel and Leah Wikel's before that; they were still there in 1940. Carrie died in 1954, as per her Oak Dale gravestone (which gives her birthyear as 1871); an exact date has not been determined. Samuel R. Smith, the fourth son of Alonzo and Ellen, was born in Paintersville on Mar. 26, 1866, and died in Urbana Township of typhoid fever on Oct. 4, 1896, aged 30. Buried in Oak Dale Cemetery, Sam was paid the following tribute by Hickory Grove Sabbath School: "In his quiet, unassuming manner he has left us an example of prudence and piety." Copies of this tribute were given to the family, put on record in the school, and published in the county; the church was draped in mourning for thirty days. Lucian Clarence Smith, the fifth and youngest son of Alonzo and Ellen, was born in Paintersville on Feb. 1, 1870. At the age of 11 he joined the Urbana Methodist Episcopal Church, and "from this time forward he seemed to care nothing about the vain amusements of the giddy world, but spent his leisure hours in the acquisition of useful knowledge... Little did we think that a life so beautiful and full of promise would go out so soon." 16-year-old Clarence died of typhoid fever, but as with his father Alonzo there was disagreement as to when: the funeral home said Sep. 2, 1886 ("near Cable," a few miles south of Mingo); the obituary and courthouse record said Sep. 3rd (in Wayne Township "near Urbana," which would include Cable). The funeral service at Oak Dale Cemetery was "ordered by A.C. Smith of Mingo and conducted by Rev. A.C. Deuel, who took for his theme 'What of the future?'" Leanna Lois Claudia Smith, the youngest child and only daughter of Alonzo and Ellen, was born in Paintersville on Oct. 17, 1876. She left school after eighth grade (so c.1890; as per the 1940 census). Even in her youth she was interested in genealogy, making notes on ancestor Andrew Snyder as early as Nov. 1896. For much of her life Leanna was afflicted with intense deafness, and "she probably felt quite isolated," F.S. 's daughter Mellie would remark. "I can't say I truly knew her. Saw her a few times only at large Smith family dinners... She was always working in the kitchen, and in her deep, loud voice would instruct we kids to carry food in to the dining room. Actually, I know now she was a very intelligent woman, and had she lived today, the affliction could have been cared for—and who knows how the story might have ended?" Leanna would sit at family gatherings with a smile on her face but unable to follow the conversation. Sometimes nephew F.S. would go over and bellow in her ear: "AUNT LEANNA! CAN YOU TELL ME ABOUT" this or that relative. After a "WHAT?" or two, she would reply "WHY YES, FRANCIS," and tell about this or that relative. 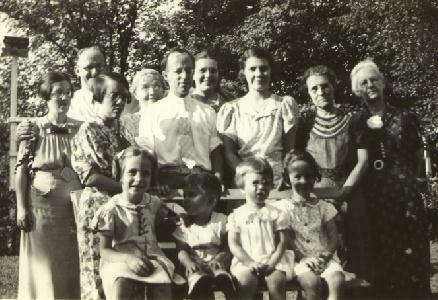 Leanna lived with her mother till Ellen's death in 1919; with brother Hal till his in 1935; and in 1940 with sister-in-law Carrie and her daughters. Leanna died in Indianapolis on Jan. 5, 1964 at the age of 87, and her collection of Smith Family Archives was inherited by niece and fellow chronicler Gertrude. MISS LEANNA C. SMITH. Miss Leanna C. Smith, 87, a former resident of Urbana, died Sunday at 10:30 a.m. in the Methodist Hospital, Indianapolis, Ind. Miss Smith was born in Greene County, O. Oct. 17, 1876, the daughter of Alonzo and Ellen Wykel [sic] Smith. She was a member of the Urbana Methodist Church. Survivors include a niece, Miss Gertrude Smith, of Indianapolis, Ind., with whom she made her home; three nephews, Clarence J. Smith, and Lester W. Smith, both of Columbus, Francis S. [Smith], of Kansas City, Mo. Funeral services will be held at 2 p.m. Wednesday in the Humphreys and Son Funeral Home, with the Rev. Ralph Simester officiating. Burial will be in Oak Dale Cemetery. I omitted to say that I got your postal Saturday week ago stating that you had frozen your ears, etc. And I don't remember whether or not I said that Mother had a letter from you two weeks ago. We will see that the Citizen is sent to the right place. Saturday, Father, Sam & I sawed logs and Father hauled them to the saw mill. At night Mother, Leanna & Sam went to Urbana. I went along to take Hal to Arrowsmith's but they were not at home. Instead of going there then, we drove down to Bryans'. Hal & Frank made music on harp and piano about two hours that night. Carlo treed a rabbit Saturday and Sam and I cut it out. The first rabbit I have seen since getting home. We got up in time for breakfast this morning (nine o'clock), weighed ourselves (Hal 140 myself 130), played the piano, bones and harp, went to Allison's at church time, had dinner and left about four. Father had come in for Mother and Clarence had the house to himself today. This is his [15th] birthday and he put in the day drawing and had a picture in a frame tonight. Your affectionate brother, M.L. P.S. Mother thinks you might send us some rabbits since they are a luxury here & you have so many. The last I heard of Will he had a bad cold and thought that if he had stayed in Kan[sas] he would not have had it. ...I went to church Sunday evening, the 8th. Hal and I concluded to call on the Misses Hedges but when we got around there we saw that they had callers so we concluded to wait until some other time. I have suggested to Hal several times that we call on Harbor's again but he says he does not like for three to go where there is but one girl and since Miss Crow went home he has no desire to go to Arrowsmith's. Dan Parlette's mill burned down last fall accidentally, at least Dan told Mother that he did not burn it down and now he has sued the insurance company for a thousand dollars insurance. George Lewis is teaching school north of Urbana 2 mi. Minnie Marsh is teaching in an old log house between here and Urbana just beyond Dugan bridge. I can think of no more news just now. Tell your little girl that I would like to see her. With kind wishes for Emma, Cal, Mort, Deborah and yourself, I am your brother, M.L. I received your letter last Saturday a week ago. The same day I posted a letter to Leanna. I was much surprised to hear of Mr. Arrowsmith's death which reminds us that we should always be ready... I received a letter from Gus today. He reports very fair weather ever since they moved. Mellie has three teeth and weighs sixteen pounds. Deborah is well. Gus mashed his forefinger a week ago today and expected to be laid up for a week. Gus has commence[d] to advise me to adopt a professional life. He always has when he writes to me & have always thought that was homesick. I shall tell him so in my letter to him & see what he says. The Deciples' [sic] meetings have closed after five weeks. Mrs. Harvey went most of the time & was so busy that she said one Sunday evening, when several of the neighbors stopped in for supper, that I had better board around that week as she would not have time to do any cooking. Mrs. Hutchingson & Mrs. Maxson agreed to it. We had ten besides the family for supper that night... I staid [sic] Tuesday night at Mrs. Maxson's and was at Mrs. Hutchingson's for supper Thursday night and also at Mrs. Hughes on Friday night for supper, that is I went there for supper & then was to go with them to the Methodist church at Lynn Creek. When I turned the corner in sight of their house they were half way up the hill on their way but they stopped for me. You can't quite cheat a schoolteacher out of his supper, however, and I went into the house, ate a piece of custard pie, half a biscuit & picked up a piece of apple pie & started on. We had about five miles to drive. They had a good meeting, three or four being converted. Over one hundred have been converted there in the last three weeks. Mrs. Harvey says that she intends to feed me up now that the meetings have closed & Mrs. Hughes wants me to come back and finish my supper... Gus says that he has not heard from home since he moved & he would like me to remind that H.G. Smith is still living at Fredonia, Ka[nsa]s. His P.O. Box is 100. I received your letter last Tuesday and have been pondering over its contents part of the time since. And I am about to give you the result of my meditations. I shall take for my text these words: Every one must work out his own salvation. Not only in the spiritual sense but in every other meaning also. My first observation will be a word of advice to Sam. Tell him to get the book "Language Lessons" that I gave Hal and study it until he can write a perfect letter as to capitals and punctuation, etc. He will find more useful things than in any other book, or at least copy-book, learn all the movements (finger, forearm, & whole-arm movements), & try to improve in his writing. Especially tell him to study the introductory oral lessons in the "Language Lessons." And try, try again for a man can make himself anything he wants to in this world. As to your grammatical studies, you had better study the "Language Lessons" also & then, Clarence, if you understand the meaning of the author when you are parsing, you will hardly fail to be correct. You said once that you did not understand percentage as well as you wished. That is something you can reason out if you will only take the trouble to look at it on the right side. There are but four things to do in all the examples that have ever been or ever will be done. Add, Sub., Multi., & Div. Your duty will be to find out which of these to do in the right place. That is all of this sermon. "Then, try, try again." I don't know whether I can come home this summer or not. I can tell you better in two or three months than now. Tell Mother that the best way of being sure of a talk with me is to come out to Kansas this Summer and then she can talk with Gus, Deborah & Mellie also. She ought to come out and see her only grand-child anyhow. The National Teachers Association will meet here in July and rates will probably be very cheap & Kan[sas] will be very pleasant now until Fall. So come one, come all. I received your welcome letter this morning, also a note from Gus saying that there was a box here for us. He said we should take a strap for it and carry it up and therefore we thought it was too heavy for me to carry and as Hal was busy at college this afternoon we were to wait till night to get it. But Hal went on his way home and brought it himself, We opened it at once. Tell Leanna it was not long until I had a chicken liver in one hand and an apple in the other. I did not wait to carve things but went at them with nature's implements. Before long I had disposed of a thigh, liver, gizzard, a drumstick and several other pieces that were lying around loose. Hal began on cabbage hearts and wound up on mince pie. I thought I would not be able to eat any more but managed to eat a piece of pie and a doughnut. After supper I read the Citizen and rearranged the things as Mother suggested. Tell Leanna that I washed the jelly off the S[unday] S[chool] paper and laid it away for future reading. Tell Mother the things arrived in good shape, a little of the plum juice only being spilled. Tell Gus that a fellow would almost need a dark lantern or something to read his letter. I don't know yet whether I made it all out. But we have the important part anyway. Tell him to try a softer pencil next time. Our school [College of Medicine and Surgery] closed Saturday for two weeks. The Announcement stated that it would not until [the] 24th but the students voted on closing Saturday and beat us two to one in favor of closing. Besides some of the Professors wanted to close. Hal's [College of Dental Surgery] will close tomorrow and begin again in two weeks. Hal went without his dinner again Saturday, working until three o'clock and was almost wild at night with the headache. We went to St. Paul's S[unday] S[chool] Sunday and received tickets to Christmas entertainment Wed. evening. Hal did not stay for preaching. We had a grand sermon on "The First Christmas" and at night another, and I believe a better one, on "Struggles of Girlhood for Work in Large Cities." ● The vitals for Hal's wives Minnie Lewis Smith and Pauline Carter Smith, plus the names and vitals of Pauline's parents, were taken from their ~g entries; as were the vitals for M.L. 's wife Carrie James Smith and her parents. ● According to the 1940 census, Pauline attended college for a year. ● Hal and Pauline's June 1914 elopement to Kentucky might have inspired Hal's niece Irene Yeazell to do the same with Charles Furrow in Feb. 1916. ● Hal's middle initial changes from E. to "D." for the 1930 census. ● On Hal's death certificate, his mother's maiden name was spelled "Winkel." ● RTJS supplied a obituary clipping for Pauline. ● Carrie Smith's father Daniel James served as a first sergeant in the Civil War. He and Eliza A. Pence married c.1867 and had eight children, of whom Carrie Jane was the second; the other seven were: Charles J./P. James (born 1869), Augusta "Gussie" James Russell (1873-1950), Anna Estella "Stella" James Randall (1875-1948), Orville William James (1877-1945), Lula "Lulu" James (born 1879), Margaret Louise James (1882-1919), and Jacob H. James (born 1884). All but Charles, Lulu and Jacob are buried in Oak Dale Cemetery; federal censuses and ~g entries provided their names and vitals. ● The original entries in F.S. Smith's 1923+ address book showed Clarence J. Smith at 187 North Haldy, Columbus OH and Lester W. Smith at 59 W. Kanawha, Columbus OH. ● Clarence and Lester's marriage data were confirmed in ~f's database of Ohio County Marriages. ● Click here to see a photo, courtesy of ~g contributor Candy, of M.L. 's grave marker. ~g also located Clarence and Gladys's resting place. ● In the 1940 census Clarence "G." and Gladys "L" Smith and their daughters lived in Columbus at 98 Whitehorne Avenue (rental $33) which had also been their 1935 address Lester and family lived at 896 Oxley Road, as they also had in 1935. ● The 1940 census noted that Carrie James left school after tenth grade; Margaret and Gertrude were high school graduates and worked 44-hour weeks. ● There are two Ridgeways in Kansas: one in Montgomery County south of Fredonia, the other in Osage County just south of Topeka. ● In a July 26, 1886 letter, M.L. Smith reports meeting and having a short talk with A.C. Deuel—who just a few weeks later would be conducting Clarence's funeral service. ~history/champaign (published in 1881) mentions that A.C. Deuel had been Superintendent of Urbana schools since 1850. ● In Aug. 1917 M.L. was given a commission in the Medical Reserve Corps and got his equipment ready, only to wait nearly a year to be called up for active service. At Florence Field, Fort Omaha in Nebraska, he mostly dealt with the Spanish influenza epidemic. "If any one asks you what I was doing," he wrote his mother in Oct. 1918, "just say with one other doctor I had nothing to do but see after 400 cases of grippe and 75 cases of pneumonia at night."